Are you also one of those people who really like the Firefox browser ? Do you also want to get your friends that far that they stop using Micro$oft's Internet Explorer. Have you also tried writing long essays on why they should move to Firefox ? Now you can just pinpoint them to Funnyfox, a site containing three nice videos of people experiencing the Firefox browser. I like them a lot ! A Palm PDA with a 4 GB hard disk, wow finally a Palm that's useful. I've been looking for a PDA that I could use as an external hard disk, so it would be easier to share files with my PC and the PDA without running the sync software. Palm has the T5 that I could use this way, but the disk is rather small, only 250 MB. But with this Lifedrive, you would have an external hard disk of 4 GB. So I really like this Lifebridge, but why didn't they add a camera to it. 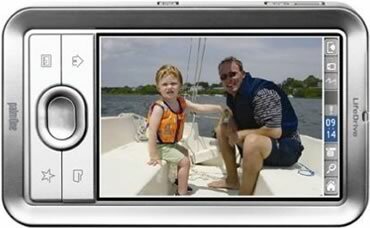 Since I have been using the Zire72 I'm taking lot's of photo's and video's of my daughter. Ok the quality isn't that good, the Zire only has a 1.2 Mega-pixel camera, but I'm able to capture a lot of moments I don't want to loose. Wired News: Hey Google, Map This! Some posts ago I blogged about Google Labs - one of the applications you can find there is Google Maps, which you (USA) can use to track taxis. Now other people have created hacks that use Google Maps for their own needs, like traffic, geo-blogging, etc ... . Maybe I could use this to locate my colleagues to see if I can share a car with them to drive to work. Or this one might even be better, locate bars ... .
Favourites or bookmarks are really nice as long as you are working on the PC where you made them. But what when you're using another PC ? E.g. you are using your Colleaugue's PC or you are on holiday... . But now Micro$oft comes to the rescue with a page that keeps track of your IE favourites, don't know if it works with Firefox or Opera ... maybe I'll try it out some time and report on it. In the meanwhile I'm using it with IE. If you want to experiment with it go to : http://www.start.com/2 . If you replace the 2 in the URL with 1, you'll end up with an on-line RSS reader. But this I didn't check out, you will have to do that yourself and maybe inform me if it was useful or not. This post just reminds me of how I installed PHP 5.0.4 on my WIN2K machine. So don't look for something mind breaking, it's just a reminder for myself. Download PHP from the php.net website. I've set the doc_root in this ini-file to the DocumentRoot in my httpd.conf from my Apache2 web server. Copied all *.dll files from the ext-directory into the php root directory. Added the php directory to the PATH variable. Copied libmySQL.dll from MySQL into the php directory. Wasn't able to use mysql_create_db(), but on the php web site they said it was recommended to use mysql_query() instead which worked. Follow the link below to have a look at XBox 360, the follow-up of the current X-Box console. Don't know if it's real, but hopefully we will find out soon. Again some pictures of the new X-Box console, and now it is for sure that's the real McCoy. Breaking the Last Dependency by Elisabeth Freeman and Eric Freeman -- All of the factory patterns "encapsulate" the instantiation of concrete classes and help to minimize (as well as localize) the dependencies your code has on those concrete classes. This articles explains what "breaking the last dependency" means, how it relates to the Factory pattern, and why you should care. Patterns and Best Practices are nice things to talk about, but there are a lot of them and I don't know them all. But every once in a while you realize you are doing well. Last week I came across the problem described in the above article and I handled it pretty much in the same way as the solution described in the article. So even if you don't know all the patterns by heart, just use your common sense and you'll come a long way. Patterns are not mind blowing solutions to problems, but they are just solutions made by using common sense.